Register your matching tool. 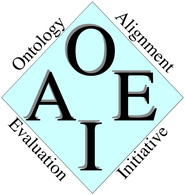 Participants must register their intention to participate in the OAEI 2017 by filling this online form. Save instructions to upload your tool. Zipped SEALS packages (e.g., LogMap.zip) can be submitted using this form (requires a google account and a valid email). Download Tutorial (May 2017) and MatcherBridge.java presented in the appendix. The Oracle tutorial (May 2017) include details about how matching systems can use the Oracle class for Interactive Matching.